SoundBytes: SoundBytes 10 - Last one before Blip! SoundBytes 10 - Last one before Blip! We are now in countdown mode to the biggest ever chipmusic event to hit Australian shores, and in our last SoundBytes for 2011 we want to remind you just how good the Australian talent is before we bring you international artists to compare with! In association with Melbourne Music week, we’ve pulled together a combination of regulars, old favourites and a new discovery to bring you Melbourne’s most high energy, low tech audio experience. 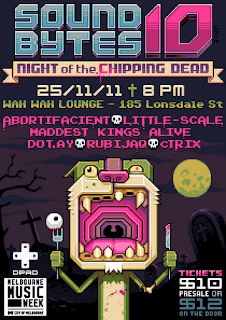 Adelaide’s Doctor Chipmusic himself, little-scale returns to Melbourne for the first time in over a year to show case exactly what he’s been up to in the last twelve months and has some amazing material to share. From Sydney, Abortifacient gets back to Melbourne after playing amazing shows in Europe and Japan earlier this year to show off a bunch of brand spanking new material for its Melbourne debut. The core of Brisbane’s chip scene dot.AY finds himself back in Melbourne, along with one of his Brisbane partners in crime Rubijaq, they will be fresh from supporting Daedelus on the Brisbane stop of his Aussie tour. Of course we haven't forgotten the locals. After two blip festival performances in a year (which, for the uninitiated, is a pretty huge deal!) cTrix is back on the line up for show #10, as is Maddest Kings Alive playing material guaranteed to get you bouncing. This will be the very last SoundBytes til our MASSIVE Two day Blip Festival shows in conjunction with 8bitpeoples in February, so start the festive season off right by getting your chip on. PS - Between the recent zombie march, the new season of the Walking Dead and Halloween, Melbourne’s gone a bit zombie mad. We’re cashing in on this craze but it means you get an awesome poster. Enjoy iLKke is a genius.